This department specializes in specific historical documents, records, and diaries, compiling and publishing in whole. 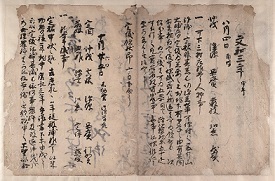 Documents are published in the Dai Nihon Komonjo series, and diaries are published in the Dai Nihon Kokiroku series. The task includes extensive cross-referencing to verify the reliability of different versions.